With the release of the Suunto EON Core, Suunto have expanded their range of large, colour display dive computers. Aimed primarily at the recreational diver, the EON Core is more compact than the EON Steel and is made with a composite bezel and different button arrangement. The Core comes in 3 colours, black white and yellow as opposed to the brushed satin steel finish of the EON Steel and is around half the weight at just 154g against 347g. Both units have a full colour display that comes showing the key information “out of the box” but can also be customised. Brightness levels are also adjustable but not during a dive. The algorithm used for both is the Suunto Fused RGBM model which most people tend to find to be on the conservative end of dive computer algorithms. Battery life is reported to be 2 months in time mode and both have a rechargeable lithium-ion battery that is charged using a magnetic USB charging cable. If your charge drops below 2 hours you cannot start a dive with it until the computer has been charged up more. For deeper divers and techies the max depth is important as this is 80m with the Core but 150m with the Steel. We have both units available to buy and are currently running a special offer on both. We have the Suunto Eon Core available at £549 with Free UK Shipping and for those looking for the top of the range the Suunto Eon Steel is available at £656. 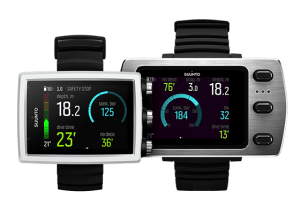 As always we would be happy to answer any questions you have and have the full Suunto range on display at our dive store in Stockport, so for advice please ring 0161 480 5745 or drop by Monday to Saturday.